Many of us are lamenting the end of July – it means the summer is whizzing by, and taking all of the fun times outdoors in the warm weather with it as fast as it’s moving. 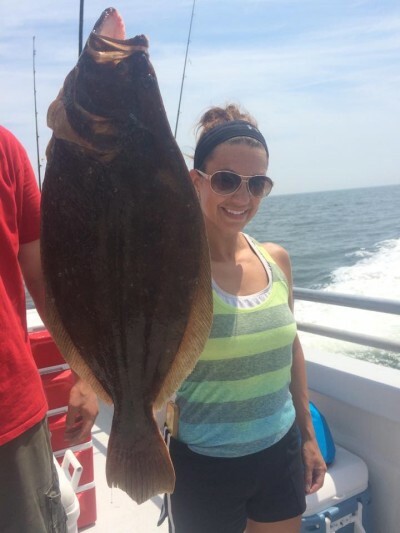 But August is a great, long month of fishing at the Jersey Shore, and one of the most exciting for a number of reasons. First off, the fluke have grown, so you’re more likely to nab a keeper now than in, say, June. But beyond the traditional species we’re all going after, August is a time when some “exotic” species invade Shore area waters from the south. Triggerfish are already making an appearance at numerous wrecks in the ocean, with several buddies reporting having hooked them this week. In Cape May County, they’re even appearing in the back bays. This delicious fish is usually only around for a month or so each year, so make sure to take a trip wreck fishing this month to get in on the action. For something everyone can try for, the folks at Grumpy’s Tackle in Seaside Park this week reported that houndfish are being caught in the bay behind Island Beach State Park. I can personally attest to the houndfish invasion in Barnegat Bay, as I spotted a sizable one lurking around the bulkhead at the end of my street one night this week. Houndfish aren’t necessarily uncommon in New Jersey, but they’re not a species you find every day. They’re also known as “crocodile needlefish,” a testament to their sharp teeth, and are long and sleek-looking, usually tinged blue. If you hook one, they’ll fight like hell and swim as fast as they can to get away, taking loads of fishing line with them. Houndfish are considered edible, though most of them that will be found in this area will be pretty small. Still, they’re a fun species to come across and are often fooled by shiny lures or poppers in the bay. Also, be on the lookout for more blowfish in the bay, as I’ve been told they’re making their presence known a bit more toward the BI buoy. Getting back to some of the staples, “snapper blues” are continuing to bite all over Barnegat Bay, including at the Mantoloking Bridge and Route 37 bridge, plus in local lagoons. Likewise, crabbing remains good at the Mantoloking Bridge, said Pete from Pell’s Fish and Sport in Brick. “There’s no shortage of fluke,” Pete told us this week, and the throwback-to-keeper ratio is down to about 10:1, much better than earlier in the season. In the suds, the fluke have been hitting 4-inch Berkeley Gulp swimmers at Brick Beach this week, just outside the wash, Pete said. In Seaside Park, some 2-pound fluke have been taken in the surf this week. The snapper blues are keeping the kids busy at The Dock Outfitters in Seaside Heights, which has its own fishing pier behind the shop and cafe. The good bay action is some consolation for a slower surf bite this week as the southerly winds have ushered in some colder water. It was down into the mid-60s Thursday on my own street and, presumably, the same elsewhere locally. “Fluking in the surf is a slow pick and sharks and rays at night have also slowed down a bit,” said John from The Dock. Over at Grumpy’s tackle, the crew had a similar report, with slower action and night and a summer-style pick of fluke. Anglers fishing Island Beach State Park should keep in mind that different regulations apply inside the park for fluke – the limit is two fish at 16 inches. That’ll do it for the column this week, but best of luck this weekend and make sure to send in your reports, tips and catch photos to daniel@shorebeat.com to be featured here!